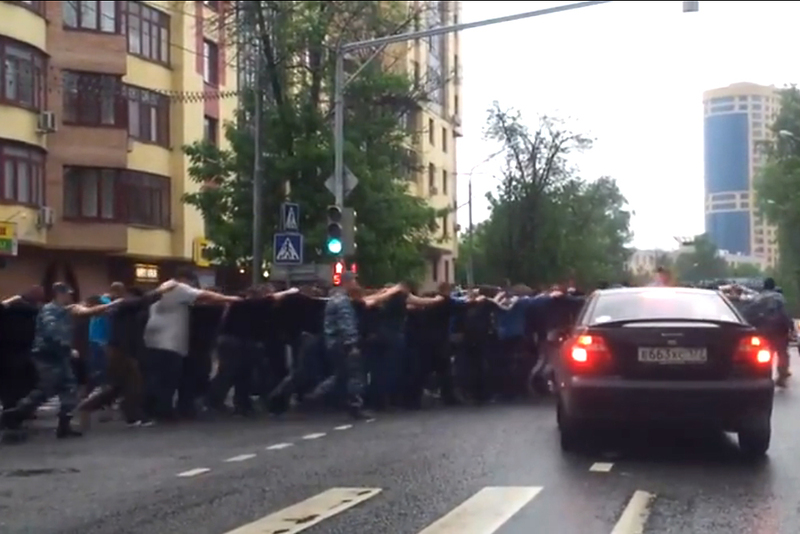 Russian police force-march labor migrants, mostly from post-Soviet Central Asian republics, along Moscow city streets, seen in a still shot taken from a video shot in late May 2013. Estimates put Central Asians at roughly 10 percent of Moscow’s population of 12 to 17 million. Scores of men on a forced march under police guard: they are not POWs en route to a labor camp; they are labor migrants in a Moscow suburb – most of them from post-Soviet Central Asian republics. The video footage taken last month should not come as a shock. Anti-immigrant rhetoric in Russia is rising – stoked, in part, by the mayoral campaign underway in Moscow. Candidates seem eager to blame problems on outsiders, especially Central Asian migrants. One candidate has even promised to rid the city of migrants – legal and illegal – within three years. Many discuss the need for new visa requirements. Sobyanin, who is running for reelection, has also broadly blamed migrants for crime. Yet Interior Ministry figures show that foreigners committed no more than 2 percent of crimes in 2012. Speaking at a bazaar in the Tajik town of Hisor, several Tajiks who regularly travel north as labor migrants told EurasiaNet.org that they face constant shakedowns when they work in Russia. One estimated he spends 15 percent of his earnings bribing police officers. Another, who sells poultry, says he feels lucky when he can get a cop off his back by “gifting” him or her a roasted chicken. The men say they must go abroad to find work in order to support their families. In just about any courtyard in Moscow, it is men from Kyrgyzstan, Tajikistan and Uzbekistan doing the sweeping, taking out the trash and clearing snow. Without Kyrgyz girls, there would be almost no one to serve fast food or stock Moscow’s grocery stores. In addition, Russia’s construction sector depends heavily on illegal migrants. There are no reliable statistics, but some estimates say Central Asians make up roughly 10 percent of Moscow’s population of 12 to 17 million. Russia’s Federal Migration Service (FMS) estimates that 2.5 million Uzbeks, over a million Tajiks, and some 550,000 Kyrgyz are working in the country. For all the fear and loathing surrounding the labor migration issue in Russia, Muscovites and Central Asian guest workers need each other, at least for the time being. For Russians, there is great demand for cheap labor. Guest workers, meanwhile, earn the money to feed their families back home. Remittances from workers abroad are keeping many Central Asian economies afloat. According to the World Bank, Tajiks sent home the equivalent of 47 percent of their country’s GDP in 2011, making Tajikistan the most remittance-dependent country in the world. Remittances to Kyrgyzstan equaled at least 29 percent of GDP. Citizens of Kyrgyzstan, Tajikistan and Uzbekistan can visit Russia for 90 days without a visa. If they have work authorization, they can stay for a year without a visa. But many stay illegally. According to the Organization for Economic Cooperation and Development, illegal migrants comprise between 6.5 and 7.5 percent of Russia’s workforce, more than in any other country. The FMS says 60 percent of migrants are illegal. Because their remittances ease the widespread poverty in Tajikistan and keep a lid on political discontent, talk of introducing visas for Central Asian nationals or, as a nationalist candidate for Moscow mayor has proposed, getting rid of Central Asians from the city entirely, prompts concern in places like Dushanbe and Bishkek. Such measures would have "a momentous impact" and represent "a substantial threat to the Central Asian governments," Kate Mallinson, a senior political risk analyst at the London-based GPW think tank, told EurasiaNet.org. "Whilst emigration to Russia provides a valuable escape valve for the young, discontented and unemployed, the migrants are also a source of vulnerability for the regime [of a Central Asian state], which fears the return of large numbers of unemployed men," Mallinson said. "Politically, the return of these immigrants could be the catalyst that sparks simmering political unrest in these countries and undermines the existence of the incumbent authoritarian regimes." Some in Central Asia believe Moscow is using the visa threat as leverage across the region. Nodira Abdulloeva of the Human Rights Center in Dushanbe points to the 2011 case of two pilots working for a Russian company. When they were sentenced in Tajikistan to long prison terms for, allegedly, smuggling airplane parts, Moscow began deporting Tajiks. Dushanbe quickly released the pilots. “There is a risk of Russia using migrants as a tool of political pressure on Tajikistan,” Abdulloeva said. “Our government understands this is our weakness.” She says the current rhetoric, much of it directed specifically at Tajiks, could be related to Tajikistan’s persistent failure to ratify a basing agreement for Russian troops. There are myriad reasons for the ramped up rhetoric, according to Aziz Niyazi of the Russian Academy of Sciences in Moscow. "Talk of visas is prompted by the fear of the uncontrolled process [of migration]. The flow of migrants is growing every year and it feeds the bureaucracy and shadow, often criminal, business," he told EurasiaNet.org. Yet Niyazi believes a visa requirement would be impossible to implement because Russian embassies would not be able to handle the number of visa applications from Central Asian nationals. "Illegal labor migration will not disappear because migrants may indicate various reasons for visiting, such as medical treatment and tourism, and then blend into the vastness of Russia," he said. Murat Sadykov is the pseudonym for a journalist specializing in Central Asian affairs. David Trilling contributed reporting.